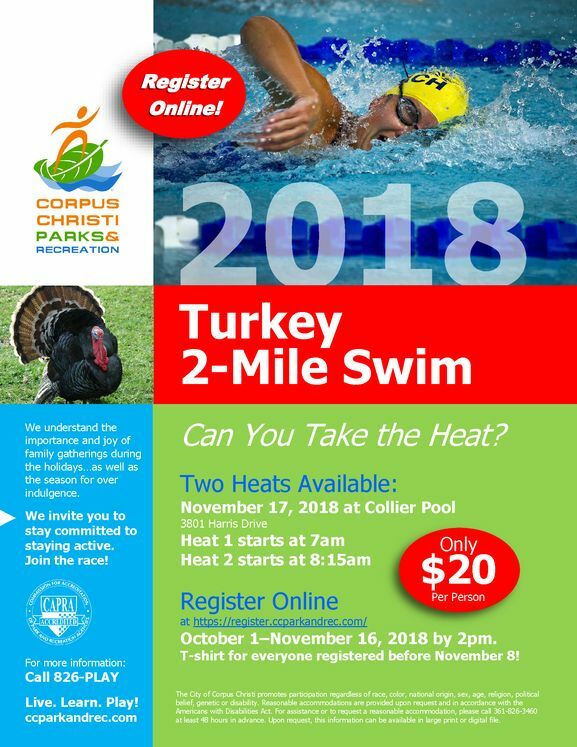 CORPUS CHRISTI, TX – The Corpus Christi Parks & Recreation Department invites you to its Turkey 2-Mile Swim on Saturday, November 17, at Collier Pool, 3801 Harris Drive. We understand the importance and joy of family gatherings during the holidays, as well as the season for overindulgence. Keep up with your workout regimen throughout the holidays by competing in this swim event. Swimmers of all ages are invited to participate. Swim start times are 7:00 am and 8:15 am. Space is limited, so please register early to reserve your spot! Cost is $20 per swimmer (t-shirt is included for all persons who pre-register and complete the swim). Pre-registration ends at 2 pm on Friday, November 16, at https://register.ccparkandrec.com/. Swimmers who register before November 8, will receive a free t-shirt! For more information, call (361) 826-3465 or visit www.ccparkandrec.com (click ‘Swim Programs & Pools’).